To say that the great British weather played an extra-ordinary part in deciding the result of Round 4 of the 2016 British GT championship would be an understatement. 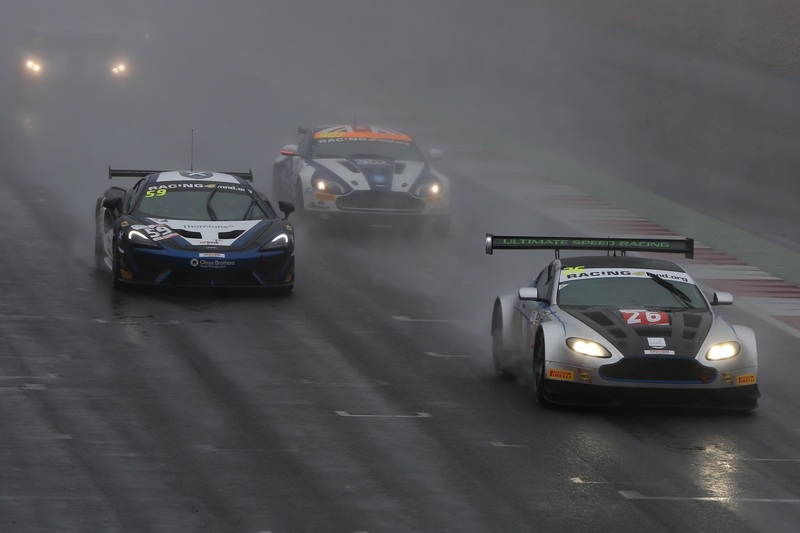 Guests from the SRO's sister European GT Series propelled the starting grid to 51 cars so it was inevitable that practice and qualifying had suffered from 'inadvertent' contact between the two classes of cars - and that was in the dry of Saturday. Race day on Sunday started for some with unnecessary excursions off track during morning warm up that meant for hurried repairs to meet the early afternoon grid but by then dark clouds had formed and rain fell heavily around the Northamptonshire circuit leaving Race Control little choice but to start behind the Safety Car. 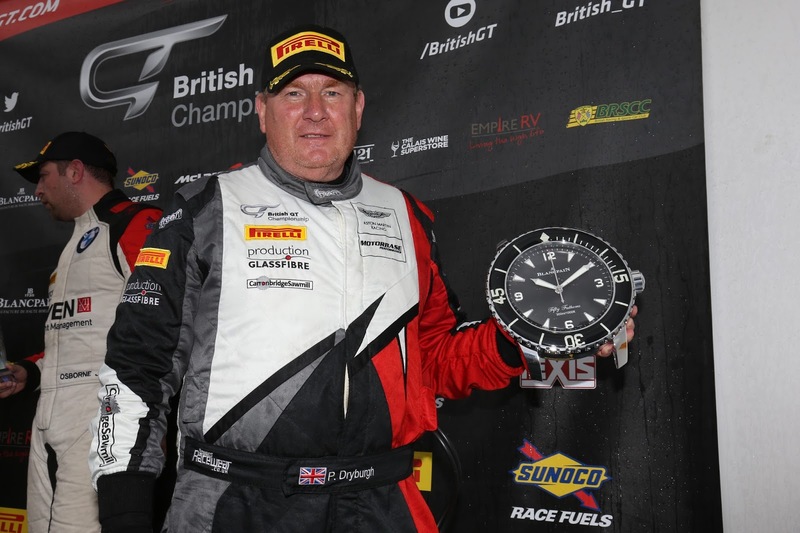 In a personal touch the British GT Championship entered cars ran with a change to their normal sun visor strips across the top of the windscreen with Racing 4 MND taking their place in memory of former GT racer Neil Cunningham, who lost his battle with motor neurone disease recently. In a surprise and immediate change to their strategy all three Barwell Lamborghini's came in for one of their three mandatory pit stops on only lap 2, that elevated the #17 car of Derek Johnston and the #1 car of Andrew Howard up one position just in time for the race to go green on the third lap. For the next couple of laps Johnston was hounding the pole setting Bentley of Rick Parfitt Jnr all the way, conscious that the Bentley had already had a heavy off in morning warm up before final taking the race lead coming onto the Wellington Straight next time about. With visibility on track being next to none, it came as no surprise to see many cars spinning off either as a result of too much right foot or simply aquaplaning - the #11 car of Mark Farmer was particularly fortunate not be be collected by the chasing pack having spun out of fifth place coming out of Luffield. 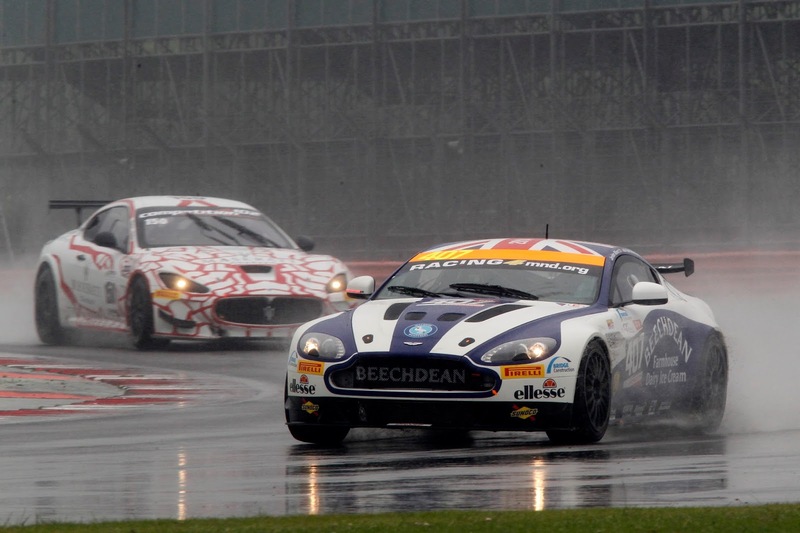 Back in the GT4 class the #407 Beechdean car of Jack Bartholomew was enjoying leading their class whilst series returnee Matt Nichol-Jones had the torment of having no functioning windscreen wipers in his Academy Motorsport Vantage GT4! After just 30minutes of track action the first casualty came into the pits with Johnston having been off track and hitting the tyre wall coming out of Village whilst overtaking a slower car damaging his car beyond time limited repair - that put the championship leading car out of the race. Moments later, however the Safety Car was again scrambled to allow for the clearing of debris and stricken vehicles - what could have been if he had waited? With many of the Am driven cars now pitting to swap over to their Pro drivers Beechdean's Ross Gunn was soon on the case lifting the #1 GT3 back up to P2 having dropped down to fifth prior to the stop. Team mate Bartholomew was still having a blinder of the race - using every inch of his single seater experience to his advantage. At the half way mark Gunn was still P2, Ross Wylie in the #8 Motorbase GT3 was holding station in P4 and Jordan Albert, now in the #407 was P3 in class. Others within #TeamAMR were however not so fortunate - James Holder was having a increasingly dizzy 'baptism of fire' in the wet spinning his #44 Vantage GT4 several times whilst he battled for grip whilst their sister #42 MacMillan car of Matty Graham faired little better ending up in the gravel after a small misjudgement at the end of the Hanger Straight loosing over eight minutes in track time, effectively ending their race. As the minutes passed the sun began to fight its way through the cloud base and it wasn't long before a drier line became apparent. Seb Morris, now in the Bentley was now on a charge catching the second placed Beechdean of Gunn hand over fist before over exuberance lead him to damaging his car in a pot hole just off the kerb line on the Wellington Straight - that was game over for them. GT4 championship leaders Johnson/Robinson also found themselves being taken out of the race by the Abba BMW Z4 collecting them going into Club, ripping off a wheel in the process. This was turning out to be a race nobody wanted to finish…..! 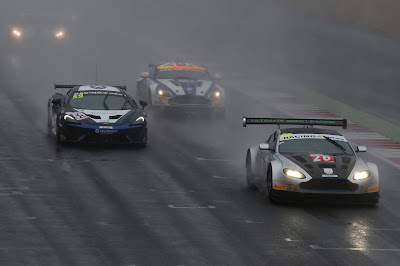 At the two hour mark, the talented Jody Fannin came through the gloom hauling his PFL Motorsport GT3 Vantage up to fifth with him, another great although inconspicuous drive from the BRDC Rising Star driver. 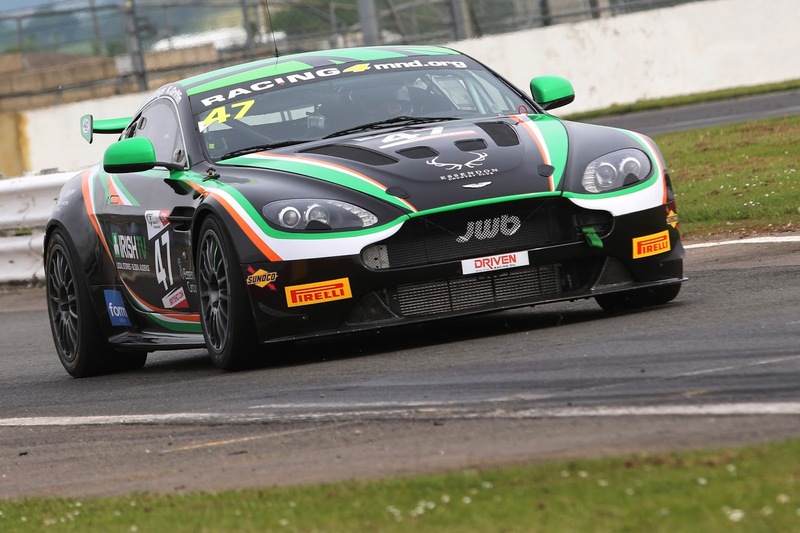 Jake Giddings also took his turn to shine amongst the visiting GT4's lifting both his morale and Vantage GT4 up to then P3 in class. Most cars were now also pitting for slicks for the continually drying track although some did try and stick it out on degrading wets having watched the first car to change over spin out into the armco. Howard was back into the #1 car but clearly wasn't enjoying the greasy track - thoughts elsewhere maybe?? Peter Littler was also back in his PFL GT3 on on his out lap having changed driver and taken on slicks. Coming around Stowe he unfortunately ran wide, added too much power that left him pointing front first into the tyre wall along the Vale - he too was out of the race with damage with a further Safety Car being required to recover them. 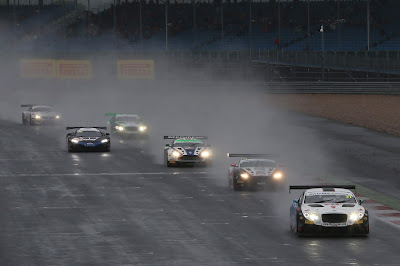 Now with just thirty minutes of the three race remaining those on slicks were now 15 seconds a lap quicker than those on wets with the Beechdean, Motorbase and remaining TF Sport GT3's dropping back again once they elected to stop again for rubber. Come the chequered flag the rain had returned but not enough to effect the results. It was a disappointing race for the Aston Martins with the GT3 class with the #8 Motorbase car of Ross Wyle and Phil Dryburgh holding the honour in P8 but one lap down. 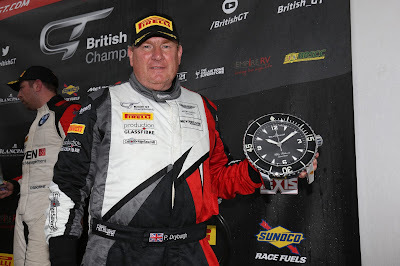 Dryburgh was however presented with the Blancpain Gentleman Driver of the Weekend Award for his efforts. One of the Lamborghini's that pitted at the end of the first lap won the race as a result of their clever change in strategy - well done to them. Over in GT4 the #407 Beechdean of Jack Bartholomew and Jordan Albert held onto their good early pace to secure P3 in class with the Academy car of Matt Nichol-Jones and Dennis Strandberg commendably just one place (of the BGT runners) behind them in their first race of the year. The championship will now enjoy a three week break before their annual excursion to Spa Francorchamps at the beginning of July.